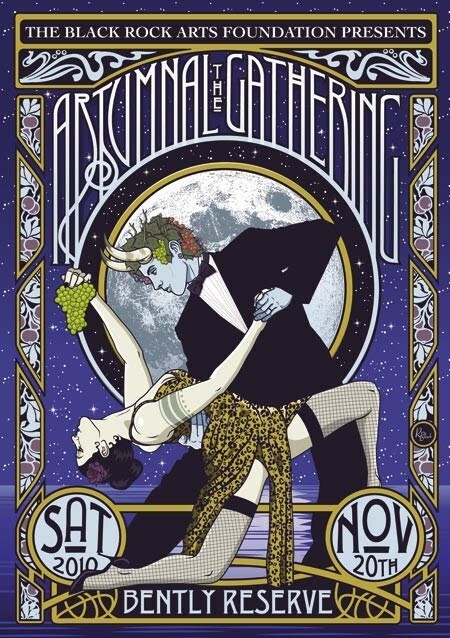 The Artumnal Gathering this Weekend! This is going to be a truly AMAZING Artumnal Gathering and do NOT miss event. Seriously! New art by the 2010 Temple crew, incredible performances starting right at opening time and going all night. These range from a globally acclaimed whirling dervish to brassy dance beats and electro-swing to laser harpist and ragtime band to seriously rockin’ theme camp dance DJs to living statues, custom decor, and wearable art–including a first time unveiling of metal sculpture headpiece masks by artist Orion Fredericks–to THE most surprisingly classy and stunningly beautiful free-swinging pole duet you have ever seen by Cirque Noir. Many surprises you will be thrilled to be there for and sorry if you miss. Get your tickets and help spread the word to make this all-important BRAF annual fundraiser a tremendous and fun success. My tip is get there right away, dress to express and enjoy it all. $250 and up: Dinner Banquet from 6-9pm + rest of night! Last year’s event sold out and this year is even better! Don’t wait. You are invited to the magnificent Bently Reserve for BRAF’s fourth annual Artumnal Gathering, an exquisite evening of tempting libations, bountiful fare, engaging art, and lavish attire. You’ll enjoy three elegant rooms, each overflowing with art and offering a stunning array of featured live performances including soaring aerial artistry, live performances, and music and DJ’s to dance the night away. Flux Factory & The Burning Man 2010 Temple Crew www.temple2010.org have created a brand new piece, “The Gateway of Wishes”, for this event (this magnificent sculpture and a fire pit from the Burning Man Temple project is also for sale this evening to benefit BRAF. ); Rob Buchholz, Michael Every, Calliope Gazetas, Tamo Designs, Miranda Caroligne, Anastazia Louise, Kristen Berg, Dicky Davies, Suzanne Forbes, Spy Emerson, Lauren Mendez, Caley Johnson, Leslie Frierman Grunditz, Philippe Glade, John Curley, Phoenix Firestarter, Deborah Yoon, Elizabeth Geddes, $teven Ra$pa + work by other artists installed in the gallery and throughout the venue. Tarot readings by the mysterious and marvelous Madame A! Join us for our pre-event dinner featuring delightful fare, cocktails, and both live and silent auctions. Last year’s event sold out! Includes a reserved table for eight guests for the Feast of Imagination, with premium seating placement in the banquet hall, premium wine selection with personal sommelier, champagne toast and other treats. Sponsor an Artist to attend the Artumnal Gathering! Can’t attend this year’s event? Make this a truly inclusive event, and honor an artist by sponsoring their attendance. Purchase a ‘Sponsor an Artist Ticket’ and we will donate it to an artist in need of a ticket!